Q-Roll Golf is on the cutting edge of technology with it's Patented Radius Face putters that are designed to strike the golf ball above it's equator producing immediate topspin and a true and more accurate forward roll. The “Monarch” is 100% Milled from 6061 Aluminum by a CNC milling machine and features Q-Roll’s Patented Radius Face Technology along with special alignment “bars” to improve alignment. 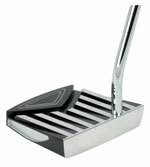 The “Celebration” series of putters is offered in 5 unique colors. Available in right or Left Hand. The “Wave” is 100% Milled from 6061 Aluminum by a CNC milling machine and features Q-Roll’s Patented Radius Face Technology along with special alignment “waves” to improve alignment. 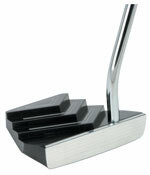 The “Celebration” series of putters is offered in 5 unique colors.